The first class of Leadership Rockland graduated in 1991 and nearly 700 participants have graduated from the program since its inception. Dan Weisberg, Administrative Lieutenant (Retired) of the Clarkstown Police Department, served as Chair from 2015 to 2018. Jan Degenshein, Principal at Degenshein Architects, served as Chair from 2012 to 2015. Dorothy Filoramo, Vice President, Institutional Advancement at Domincan College served as Chair from 2009 to 2012. Roberta Zampolin, Retired Superintendent Nyack Public Schools, served as Chair from 2006-2009. Frank Borelli, Jr., Principal with the Ducey Insurance Agency, served as Chair from 2003-2006. Bill Madden, President of Madden Communications & Marketing, LLP served as Chair from 2000-2003. Dohn Harshbarger, Retired Vice President of Student Development at Dominican College, served as Chair from 1996-2000. Dr. L. John Durney III, Provost & Vice President for Academic Affairs at St. Thomas Aquinas College and also a founder of Leadership Rockland, served as Chair from 1994-96. Mark Rothenberg, former Vice-President with United Water New York and Chapter Chair for Rockland SCORE, served as Chair from 1992-94. C. Scott Vanderhoef, Rockland County’s Chief Executive and a founder of the Leadership Rockland program, served as Chair from 1990-92. 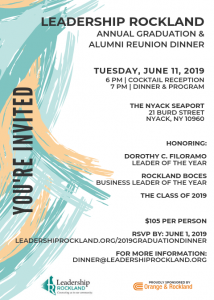 The Graduation Dinner & Alumni Reunion will be held at The Nyack Seaport on June 11th. Tickets and Journal Ads can now be purchased. Click the invitation to go to the Dinner page. A link to the Journal Ad page can be found there as well. Copyright © 2019 Leadership Rockland. Maintained in-house by Leadership Rockland.